The mastermind behind this terrific CD, Adrian Chandler, is not only Director of La Serenissima and a violinist of flair and distinction; he is also a meticulous scholar, as his excellent booklet notes reveal. He has clearly engaged in much fruitful research in preparing for this recording, even carrying out imaginative reconstruction where necessary. The result is a rich musical treat. All of this music was written by the �Red Priest� for use in the Chapel of the Pietá, the Convent School for orphans (or �foundlings�) in Venice. 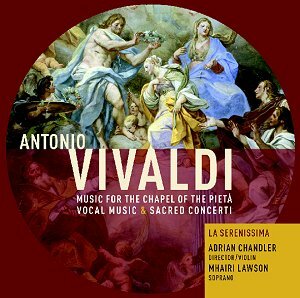 The music on the generously filled disc consists of three instrumental concerti and two solo vocal cantatas, Laudate Pueri and Salve Regina. These are sung by the Scottish soprano Mhairi Lawson, who turns in thoroughly delightful performances. She gives the more lyrical movements, such as the very beautiful Et Jesum Benedictum that concludes Salve Regina, an easy and natural expressiveness, while she is more than equal to the bravura of the quicker movements. Laudate pueri contains much that represents Vivaldi at his very best, for example Quis sicut Dominus with its tip-toeing staccato in the strings. This, and all the other instrumental music, is realised superbly by the players of La Serenissima, the enlarged chamber ensemble named after the city of its inspiration; the name being, of course, a poetic soubriquet for Venice itself. The string sound is pure and bold, yet capable of great subtlety when required. They are underpinned by a continuo section of great richness: the harpsichord of Joseph McHardy, the theorbo (bass lute) of Richard Sweeney, and the organ playing of Robert Howarth. Despite the scholarship, there is nothing �academic� about the performance of this music. Indeed, it is exuberant and often full of élan and humour. The final movement of RV554a is a sprightly Allegro which inspires McHardy to an outrageous three octave glissando, more normally associated with jazz pianists � fun! Elsewhere, fine contributions come from cellist Sarah McMahon and organist Robert Howarth, the latter in the two concerti with organ solo parts. It�s not clear whether Howarth is playing the organ of the lovely old church in East Sussex where this is recorded; I doubt it, as, as far as I can gather, that instrument dates only from the late 19th century. Thus I think it is an imported chamber instrument that is used. Very fine it sounds, too. The balance at all times is exemplary � everything can be heard with clarity and great beauty. Vivaldi is a funny old composer; sequences of mind-numbing repetitiveness are so often succeeded by sudden twists of utter harmonic or textural magic. Infuriating, but, in performances as wonderful as these, you can�t help loving it!